In memory of Jane Greenhalgh, wife of James Greenhalgh, Solicitor of "Greenhill", Deane. It depicts three of the Beatitudes from Jesus's 'Sermon on the Mount'. (St. Matthew Chapter 5; St. Luke Chapter 6). Left light - "Blessed are they that mourn ..." Martha (or Mary) meeting Jesus when he was called to heal Lazarus, their brother. However, Lazarus had died before Jesus arrived at Bethany, but he raised Lazarus from the dead. St. John Chapter 11. Central light - "Blessed are the merciful..." Mary visited her cousin Elizabeth to salute her, after the Angel had told her (Mary) that Elizabeth would bear a son. St. Luke Chapter 1. God's mercy had been showered on both Mary and Elizabeth. 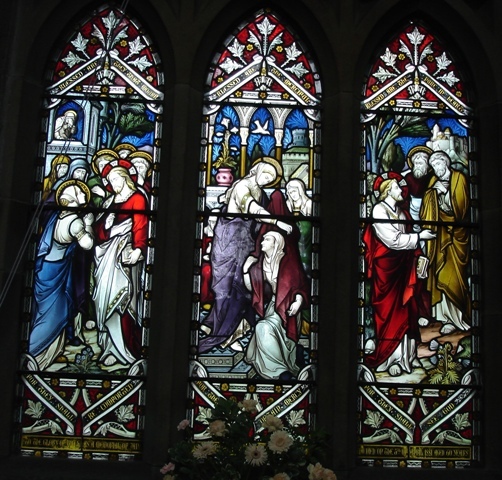 Right light - "Blessed are the pure in heart..." Depicts Jesus with two of his disciples, probably Philip and Nathaniel. Jesus said of Nathaniel "Behold, an Israelite indeed, in whom is no guile". St. John Chapter 1, verses 43-50.